The Sky Vac System that we use is a very powerful machine. 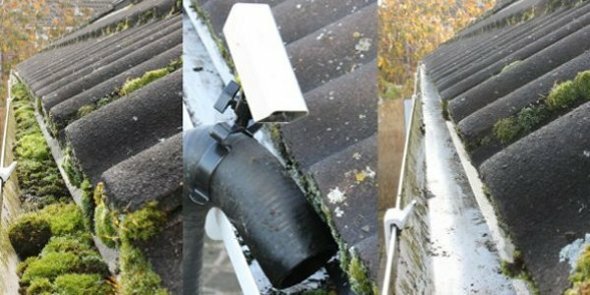 From extensive research we have carried, we have found this to be the best system for cleaning guttering. We operate the Sky Vac System from the ground - safety always comes first. The Sky Vac System is a vacuum operated machine, using extendable carbon poles to reach the desired height, with a swan-neck attachment to reach into the guttering. The Sky Vac System uses two vacuum motors to clear out leaves, debris, including grass and moss that accumulates over time - and removes any blockages. How can I see the guttering is clear afterwards? There is a wireless camera placed on top of an inspection pole - used first to inspect the guttering and identify any potential problems beforehand. Once the work is complete, it can then be used to check all the guttering has been cleaned. How high can the system operate? The Sky Vac System can operate up to four stories in height and to even the most difficult to reach areas of a property - like conservatories. By using the Sky Vac System, there is no need for the expense of having to erect scaffolding or cherry-pickers. How often should my guttering be cleaned? We would recommend once a year. As your guttering catches all the rain water that runs off your roof, any blockages preventing it from draining away can give rise to water leaking into your property - causing major water damage. Don't delay - call us today to have your guttering professionally cleaned!